I mean, really, who knew? Well, obviously a few people knew. When Bil Keane, creator of the daily “Family Circus” newspaper panel, died about a week ago, I noted in this blog that while Keane’s panel wasn’t my favorite strip — that honor falls to “Calvin and Hobbes” or “The Far Side” — you had to admire Keane for his staying power. Although he had turned over the strip to his son, Jeff, in recent years, he maintained it for decades after creating it in 1960. Now, thanks to a terrific Comics Journal column by Bill Griffith, the creator of the offbeat “Zippy the Pinhead” strip, I have a newfound appreciation for Keane’s sense of humor. Griffith writes about how he didn’t expect to have much in common with Keane and other grand old masters of the comics page until he met them at a National Cartoonists Society dinner in 1990. Griffith said Keane and the other members of the old guard were surprisingly funny and profane and the farthest thing from their squeaky-clean strips that you could imagine. 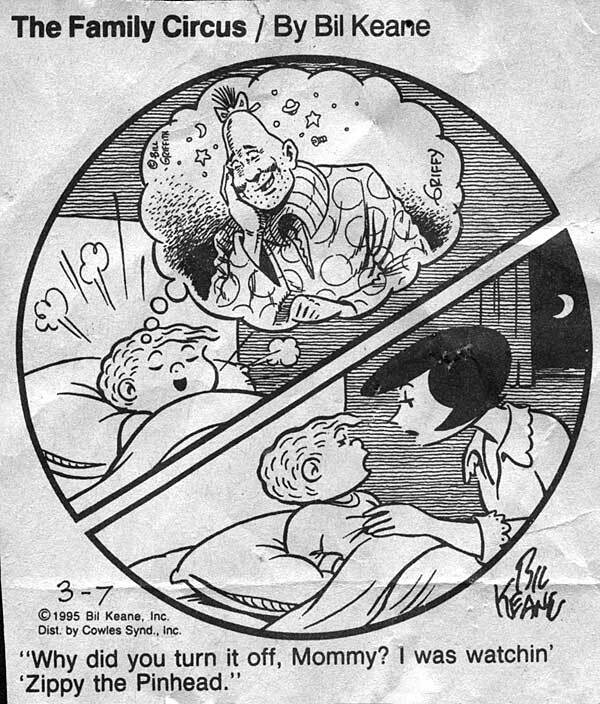 Keane favored Griffith with a tip of the hat with a 1995 panel in which young Billy is dreaming of Zippy. Keane even asked Griffith to draw Zippy for the panel. Now, if you can get past the fact that the mixing of the two comics is perhaps more disturbing than funny, I can’t think of a revelation that made me smile more and think more highly of Keane. It’s unfortunate that we sometimes appreciate people the most after they’re gone. And while I will still no doubt shake my head a bit when I come across a “Not Me” or ghostly grandparents panel in “The Family Circus,” I won’t be doubting Keane’s good sense of humor. This entry was posted in newspaper comic strips and tagged Bil Keane, Family Circus, Zippy the Pinhead on November 15, 2011 by keithroysdon.